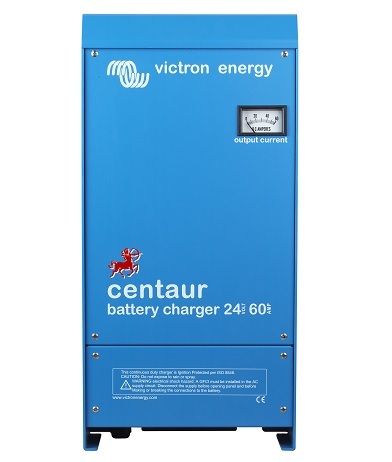 The new Centaur range of battery charger from Victron Energy have been designed to be a true world-wide product. Universal compliance and input/output specifications are cornerstone characteristics of the new range from the established Dutch manufacturer. Designed to meet the requirements of both CE for Europe and UL for the United States, the Centaur model range features auto-ranging input covering 90-265VAC 50/60Hz input meaning they can be used anywhere in the world. The Centaur range of battery charger spans 12V and 24V models from 16A through to 100A. The fact that the same product is suitable for any boat, regardless of the intended market or where the boat will be taken, is a great advantage to the boat builder and the boat owner in equal measure. Conscious of the price sensitivity in this competitive market, a single model range for all markets also means more competitive costs. Without compromising Victron Energy brand qualities this range is comprehensive, competitive and compatible wherever in the world they might be used. These battery chargers are suitable for any application and not just restricted to marine use.